This is the journey of Chris Riser: 50 year old lawyer and father of two teens. 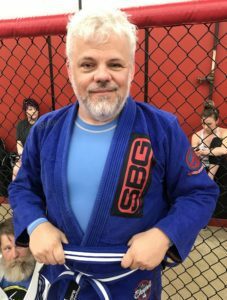 Before coming to SBG Athens, Chris struggled with middle-age stress, weight gain, and the motivation to deal with them. On the recommendation of his trainer at another gym, he reached out due to his love of fitness kickboxing. He wanted to learn about real kickboxing. After a few years of kickboxing classes Chris “learned how to punch, kick, and defend, had a lot of fun, and got in better shape.” At 44, he was in the best shape of his life and boxed competitively at the famed Gleason’s Gym in Brooklyn, New York. Although he lost that fight it didn’t stop him from getting his first victory a couple years later in an old high school gym in West Virginia. It was later that Chris was inspired by another gym member to get into powerlifting. He competed a couple of times and “put up numbers that made [him] happy.” Finally, after several years of watching everyone training BJJ, he finally “plunge[d] into full-on striking and BJJ training a little over a year ago.” His only regret is that he didn’t start sooner. Show up to train, even if you don’t want to. I’ve never regretted showing up. I’ve regretted not showing up a bunch of times. Believe in “This is SBG; you will be OK.” The instructors know what they’re doing. Your training partners are there to help you, not to beat you or hurt you. Prioritize protein and lift heavy weights. Are You a Lone Wolf Suffering from Inadequacy Issues? This is the first in a series of blogs devoted to individual members of our Tribe. They are sharing some of their history, both prior to and during their time at SBG Athens. They tell of struggles, fears, concerns, and questions about wanting more from life. There is a Hero’s Journey in all of them. They each recognize that which they are lacking, search for guidance, “Slay The Dragon”, and provide insights to others on a similar quest. It is our sincere hope that contained herein, you the reader see there is help for you within these walls. Join the premier martial arts, Brazilian Jiu Jitsu, and Self-Defense gym in Athens and learn why: This is SBG, you will be okay. 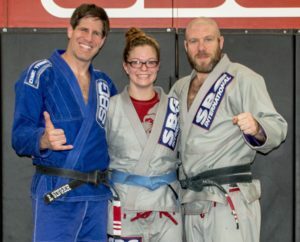 This is the journey of Cate Harris; student (and coach) at SBG Athens. Life before she started training at SBG Athens was spent as a “Lone Wolf” struggling with severe inadequacy issues. TFW has helped her find a strength she never knew she had. Learning how to properly lift weights and run fast has helped her perform pull-ups and pushups with ease. I’ll let Cate tell you in her own words about her new found shape, “I now have the toning I have always wanted (hello ‘V’ on my hips and what’s up triceps n’ biceps! )” Additionally, she has more energy throughout the day and sleeps much better. This is a far cry from her nights of insomnia and her trouble falling and staying asleep. “Now? ZzZZzz!” She now has a confidence to face whatever comes her way. “He who does not howl may never find his pack.” Author Charles Simic. “Martial Arts is the fight against yourself.” SBG Coach Liam O’Shaughnessy. “Everything should be kept as simple as possible, but no simpler.” SBG President Matt Thornton via Albert Einstein.